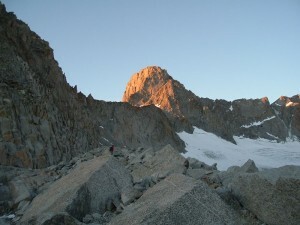 This route is like a shorter version of the East Buttress of Whitney. It's a big approach for pretty short route so you might want to add on a direct 5.8 start that adds a few hundred feet. From the easier normal start a few 5.6 pitches lead to an impass, here go around to the right on a 5.7 airy and fun traverse. Then a few hundred feet of easy climbing lead to the summit. Which SuperTopo guidebooks include a topo for Swiss Arete?